Sam Sifton is Right – Make This Chicken and Shallots Dish! I had seen this recipe both on Twitter and in the New York Times last week and it sounded too good to pass up. Sam Sifton, who writes food articles for the New York Times, had gotten the recipe from Andrew Zimmern, the well-known chef and host of Man vs. Food. Andrew Zimmern had gotten the recipe from his wife Rishia, who adapted the recipe from one from Martha Stewart. Needless to say the recipe has made its rounds and it is quite simple but makes a really delicious chicken dish with just a few ingredients that you may already have around the house. I love simple recipes like this one so I knew I was going to try it as soon as I saw it. Rinse the chicken thighs in water and pat them very dry with paper towels. Sprinkle the chicken thighs with the flour, kosher salt and pepper. Melt the butter in a large, heavy-bottomed pot or skillet set over medium-high heat. 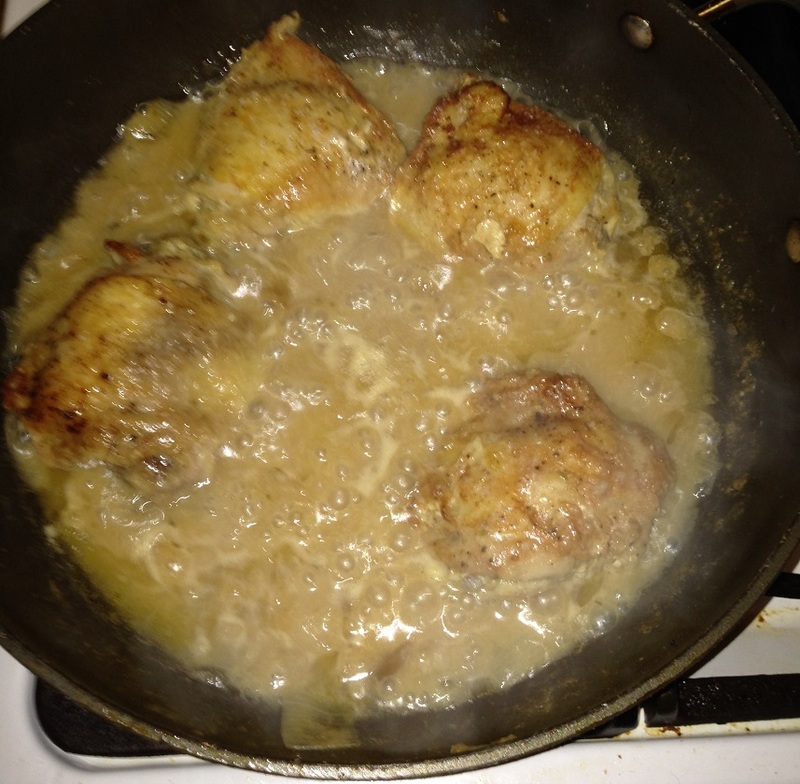 When the butter foams, cook the chicken thighs, in batches if necessary, until the chicken is well browned and crisp on all sides, about 3 to 4 minutes per side. Set the chicken aside. Add the whole shallots to the pot and saute them in the butter and chicken fat until they begin to soften and caramelize, approximately 10 to 12 minutes. Add the wine to deglaze the pot, stir with a large spoon, then add the Dijon mustard and the sprigs of tarragon, then the chicken thighs. Cover the pot, turn the heat down to low, and simmer the chicken for 30 minutes. Remove the lid and allow the sauce to reduce and thicken, about 15 to 20 minutes. Add the cherry tomatoes to the pot, stir lightly to combine and serve immediately. It is a very simple recipe that turns out some great tasting chicken with a nice sauce that is flavored well by the wine, mustard, tarragon and the shallots. I ended up cutting the recipe in half because 4 chicken thighs are more than enough for the three of us for a typical meal, but if you are feeding a larger group you could go with the full recipe. I served the chicken with some white rice and roasted asparagus and I think it all went really nicely together.